Jabbar Washington speaks with reporters after a judge threw out his 1997 murder conviction. 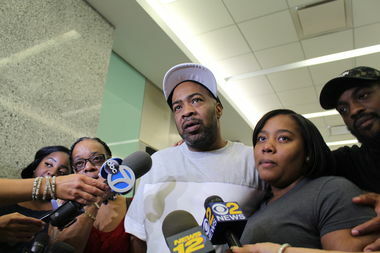 DOWNTOWN BROOKLYN — A Brownsville man who spent the past 21 years in prison walked out of Brooklyn Supreme Court a free man Wednesday after a judge overturned his 1997 murder conviction. Jabbar Washington, 43, was set free after prosecutors found fatal flaws in his original conviction, including the withholding of witness testimony and misleading statements at trial by the arresting detective, according to Assistant District Attorney Mark Hale. Washington, whose family gasped sobs of relief as a court officer unlocked his handcuffs, told reporters outside the courtroom that he was looking forward to going home and getting to know his children and grandchild. Washington's conviction was the 23rd overturned by the Brooklyn District Attorney's office's Conviction Review Unit and the eighth conviction to be overturned that was linked to Washington's arresting officer retired NYPD Detective Louis Scarcella. More than 70 cases linked to Scarcella have been identified by the DA’s conviction review unit as needing further investigation. Washington was arrested in 1996 for the murder of Ronald Ellis during the botched robbery of a drug den in Brownsville on Jan. 21, 1995 in which a gang of masked, armed intruders barged into the apartment blasting away, wounding five people and killing Ellis, prosecutors said. He was convicted in 1997 and sentenced to 25 years to life in prison in a hearing at which the judge told him “your parole officer hasn’t been born yet,” according to defense attorney Ron Kuby. Lisa Todd, a witness who spoke with Scarcella, initially picked Washington out of a lineup, but she clarified days after the lineup that she had identified Washington as having previously lived in her building, not as a suspect in the robbery, Hale said. Despite her clarification, which was noted at the time in a document known as a grand jury synopsis, prosecutors at the time failed to disclose the information to Washington’s defense attorney, according to Hale, who heads the office’s conviction review unit, a widely praised initiative of the late DA Ken Thompson. “It is the opinion of the CRU that this was done intentionally,” Hale said, referring to the unit in the Brooklyn District Attorney’s office dedicated to investigating potential wrongful convictions. Todd was murdered in 2006, Hale said, making it impossible to revisit her testimony. Prosecutors do not plan to retry the case. In addition to the lack of disclosure by then Assistant District Attorney Kyle Reeves, blame fell on Washington’s defense attorney, who failed to correctly cross-examine Scarcella and allowed misleading statements about Washington to go without objection, according to Washington’s current attorney Ron Kuby. Kuby criticized Scarcella harshly in court, but he said the wrongful conviction never could have happened without more deep-seated rottenness in the Brooklyn District Attorney’s office at the time. Former ADA Reeves left the District Attorney’s office in 2012 and now works as an asbestos trial attorney, according to his biography page at McGivney, Kluger, & Cook, where he is now a partner. According to his page, Reeves was formerly involved in teaching other prosecutors cross-examination techniques and ethics. Reeves did not immediately respond to a request for comment.